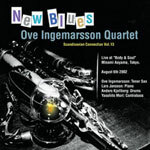 New Blues offers more than an hour of agreeable post bop jazz, handsomely wrapped and ably performed by tenor saxophonist Ove Ingemarsson's quartet from Sweden, similar to much of what I've heard from other groups here and abroad. That's the good news. The bad news is that it's similar to much of what I've heard from other groups here and abroad. In other words, it seems to me I've heard these songs before; or if not these particular songs, then others that closely resemble them. Don't get me wrong; these guys can really playand if I were putting together a team I'd want someone as resourceful as pianist Lars Jansson to be my quarterback. But good as they are, there's nothing so special here that it would separate them from groups with comparable talent and rapport. Having said that, there is nothing that is less than admirable either. Ingemarsson is an honor student in the Lovano/Brecker/Potter school of cutting-edge improvisation who never fails to deliver, while Jansson is a seasoned pro who rests comfortably in any framework. The backup duo, bassist/producer Yasuhito Mori and drummer Anders Kjellberg, is trim and supportive. The concert, recorded in front of an audience at Body & Soul in Tokyo, consists of seven original compositionsfour by Jansson, two by Ingemarsson, one by Moriand Sigmund Romberg/Oscar Hammerstein's "Softly as in a Morning Sunrise, which closes the program. Jansson's ballads, "Resting in the Shadow and "Easy, are idyllic peaks that bring out the best in everyone, while "Sunrise is a radiantly swinging finale. Jansson also wrote "New Blues and "Success Failure, Ingemarsson "Third Star and "Seems Like Yesterday, Mori the graceful "Waltz for Vana. Even though they plow no new furrows, Ingemarsson and Co. are invariably sharp and securely on the mark, and the concert is a pleasure to hear and appreciate. Track Listing: New Blues; Waltz for Vana; Third Star; Seems Like Yesterday; Resting in the Shadow; Success Failure; Easy; Softly as in a Morning Sunrise (65:15). Personnel: Ove Ingemarsson: tenor saxophone; Lars Jansson: piano; Yasuhito Mori: bass; Anders Kjellberg: drums.